Tons of travelers visit Bend with growlers in hand and their sights set on tackling the Bend Ale Trail. Others sip their way through distilleries and cideries that make up Drinkable Diversions. But what if you want your liquid libations with no risk of hangover the next morning? Yummy passionfruit limeade from El Sancho. Whether you don’t dig alcohol in general, or you’re taking a break for some reason, there’s no need to stick with water. Here are thirteen tasty booze-free beverage options in Bend. They have some of the tastiest tacos in town, and their candied yams are to-die-for. 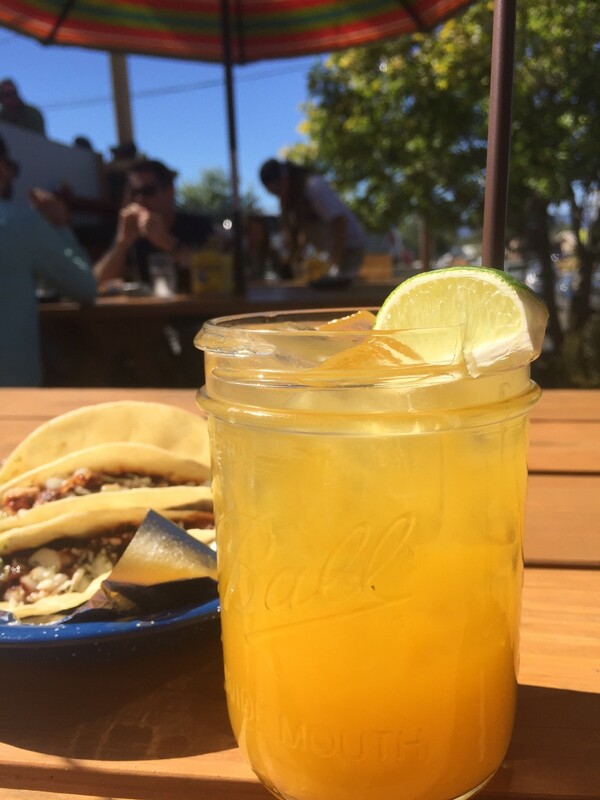 But El Sancho also makes one of the most flavorful, refreshing alcohol-free beverages in town. Each day, the folks at El Sancho squeeze a buttload of fresh limes to make their limeade base. You can order it just like that, but to really have your socks knocked off, order a passionfruit limeade. It’s blended with real passionfruit puree and so flavorful you’ll polish the whole thing off before your meal arrives. 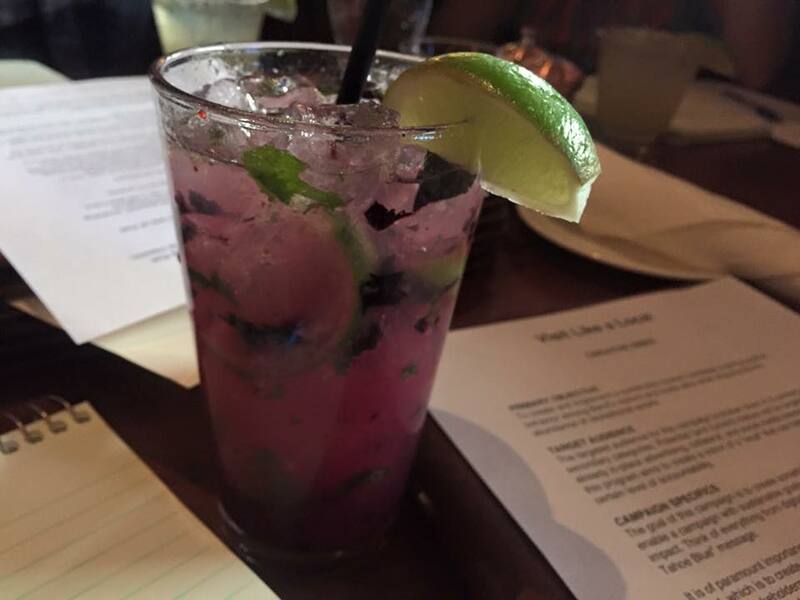 Plenty of upscale Bend restaurants will be happy to mix you a “mocktail” version of your favorite cocktail on their menu, but one of my favorites is the Blueberry Mojito at Brickhouse Steak House. The tasty virgin Blueberry Mojito at Brickhouse. It’s made with freshly-muddled mint, fresh lime, oodles of plump blueberries, and a healthy splash of ginger beer. Bonus: It looks just like its alcoholic counterpart, and as plenty of women can attest, that’s handy if you want to swill a booze-free beverage without fending off unwanted inquiries about pregnancy. The first time I tasted this, I’d taken two food journalists to dinner at Ariana Restaurant to show them one of my favorite Bend culinary gems. Since I prefer to stay sharp when I’m in work mode, I asked the server for a non-alcoholic option. I was so blown away by their simple concoction of soda water, elderflower syrup, and lime that I wanted to drink this all night and skip the wine (which is a shame, considering Ariana’s wine list, but I digress). So simple, yet so flavorful, this little n/a soda puts most boozy cocktails to shame. Want to feel like you’re sipping something extra-special on a romantic date night, but skip the booze that might sabotage the romance? 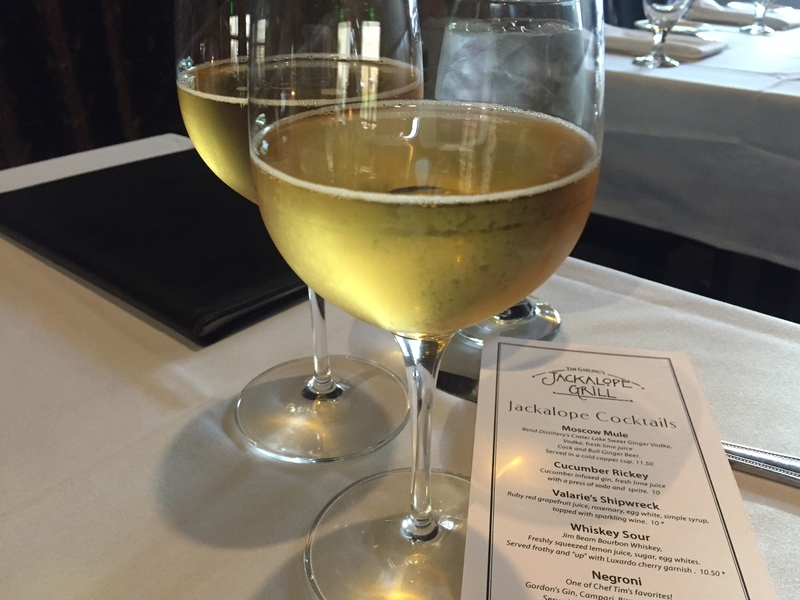 Order a glass of Duche de Longueville non-alcoholic sparkling cider at Jackalope Grill. Foodies will love this extra-special non-alcoholic cider at Jackalope Grill. This alcohol-free cider comes from a 50-year-old apple orchard near Dieppe, France, where 15 chosen apple varieties are used to produce it. It’s served in a fancy wineglass to make the whole experience feel more luxurious. As the name implies, Mother’s Juice Café has plenty of freshly-squeezed juice to pick from. But my favorite libations here come from the smoothie menu. Pick from creative concoctions like the Little Bear (apple, strawberry, peach, vanilla yogurt, honey, fresh orange juice) or the Lavender (apple, mixed berries, banana, vanilla yogurt, hemp milk). But my favorite thing to do is to ask the smoothie experts at Mother’s to mix up something special. I spotted the cardamom syrup behind the counter recently and asked what would taste good with that. A few minutes later, I was sipping a delightful blend of fresh coconut meat, banana, almond milk, and the aforementioned cardamom. Delicious! Some people get snarky about chain restaurants, but the parents among you know sometimes that’s part of the package when you’re traveling with young kids. The familiar comfort of Red Robin’s bottomless freckled lemonade (complete with juicy hunks of strawberry) is made more delightful by the killer views of the Deschutes River you’ll soak up if you’re lucky enough to snag a window seat or a spot on the patio. 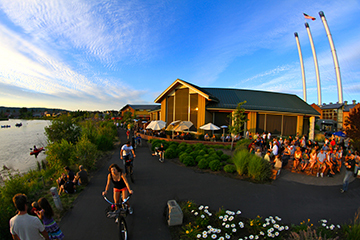 Scope out the Deschutes River in the Old Mill District when you sip your Freckled Lemonade at Red Robin. Bonus: Catch a movie or do some shopping in the Old Mill District when lunch is done. I’ve always been amused by the name “Egg Cream,” since the beverage contains neither egg nor cream. Popular on the East Coast, Egg Creams are made with soda water, chocolate syrup, and half-and-half. Locally-owned Goody’s Chocolates is a great place to grab one, with locations in several spots around Bend and Sunriver. I recently introduced my 10-year-old stepdaughter to the beverage, and upon her first sip, she declared it her new favorite drink. I’ve always said the facility tours at Deschutes Brewery are fun for kids from a science/how-things-work perspective, but they recently made things even more kid-friendly with the addition of their own craft-brewed ginger beer and root beer. Want to hit a brewery but skip the alcohol? 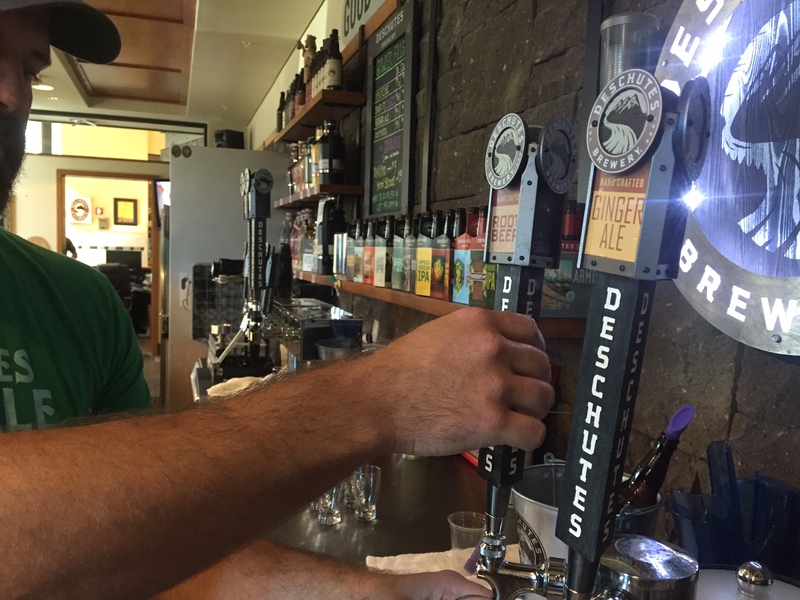 Try a freshly-brewed root beer or ginger beer at Deschutes Brewery’s tasting room. Even the grownups among you will appreciate having a couple alcohol-free options available. When I swung by during a mid-afternoon outing with Bend Electric Bikes, it was nice to do a little beverage tasting without sucking down anything that would render me groggy for the remainder of my workday. 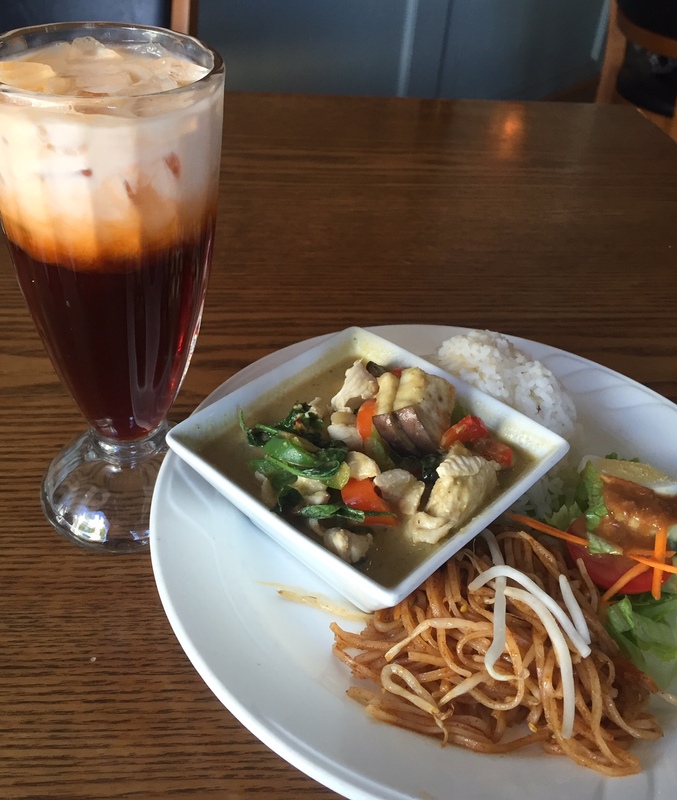 Bend has tons of terrific Thai restaurants, and all of them offer some variation on the classic Thai iced tea. But there’s something about the one at Toomie’s that always seems extra special. Maybe it’s the aesthetic of the tall glass it’s served in, or the sweet, slightly-smoky flavor. Maybe it’s the way it pairs so perfectly with the green curry chicken I adore so much. Either way, this sweet and creamy tea makes a perfect non-alcoholic accompaniment to your meal in downtown Bend. I’ve gushed previously about my fondness for this cozy little café specializing in raw and vegan food (which is noteworthy since I’m a devoted carnivore). In addition to having an awesome array of salads, wraps, and desserts, Salud Raw Food has a killer selection of fresh, organic juices. They expertly blend fruits, veggies, herbs, and spices for optimum flavor and zing. Try unique concoctions like the Hippy Hoppy (apple, carrot, spinach, lemon, beet, and ginger) or the Heavy Metal Detox (cilantro, lime, apple, pineapple, mint, and celery). And save room for dessert. This one’s not for humans (though it’s totally safe to drink if you did want to try it). Dawg Grog is the original “dog beer,” a delicious and nutritious liquid treat supplement for dogs that’s made right here in Bend. Crafted with brewers wort, vegetarian k9 glucosamine, and vegan trace minerals, it’s a fun and alcohol-free way to share a cold one with your pup. Pick some up at retailers all over Bend, including the Bend Visitor Center. Italian sodas were my go-to booze-free beverage for many years, with their simple blend of soda water, flavored syrup, and (optional) half-and-half. Unique flavors have always been my favorite, so I fancy the Italian sodas at Bellatazza Coffee in downtown Bend. Their syrups are produced by a local maker, who creates intriguing offerings like cardamom, lavender, and pumpkin spice. If Italian sodas aren’t your thing, have some of the syrup added to your coffee or chai.